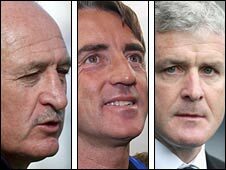 Mark Hughes, Roberto Mancini and Luis Felipe Scolari are among those on Chelsea's shortlist for the managerial job, BBC Sport understands. But Guus Hiddink, Frank Rijkaard and Sven Goran-Eriksson are not major contenders to replace Avram Grant. Former Juventus coach Didier Deschamps has also said he is on the list. Mancini's agent Maurizio De Giorgis told BBC Sport: "He no longer works for Internazionale. He's available for work if he gets a phone call." On Tuesday, Giorgio De Giorgis, who works in tandem with his brother Maurizio, said that Mancini had been sacked by Inter following a 25-minute meeting with president Massimo Moratti. After two days of silence from the club, they confirmed on Thursday that Mancini had been dismissed. Maurizio De Giorgis added: "He's disappointed and surprised. He won three Italian league titles in a row, which has never been done before." Giorgio De Giorgis also claimed former Chelsea boss Jose Mourinho had been lined up as Mancini's replacement. According to BBC sports editor Mihir Bose, Chelsea's decision to look more closely at Hughes, Mancini and Scolari "follows a reappraisal by the powers-that-be at Stamford Bridge as to what they feel the new manager needs to do for the club." He added: "The view is Chelsea need to use the appointment to make the club feel popular, if not loved, not merely by their fans but by the public." Blackburn manager Hughes has impressed during his three-and-a-half year spell at Ewood Park, guiding Rovers to seventh in the Premier League last season. Earlier this year, the former Chelsea striker was one of the front-runners to succeed Sam Allardyce as Newcastle manager before Kevin Keegan took the job. Portugal manager Scolari is also reportedly wanted by Manchester City to replace Eriksson. 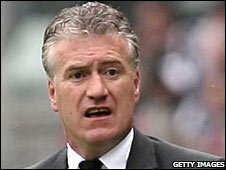 Former France captain Deschamps, 39, was a member of Chelsea's FA Cup-winning side of 2000. As a coach, he led Monaco to the 2004 Champions League final and then took Juventus back into Italy's Serie A.
Deschamps, who has been waiting to return to football having taken a break from the game a year ago, told Monaco-based radio station RMC: "Three or four managers are on the list and I am one of them. It would be hard to refuse Chelsea." Rijkaard was thought to be one of the leading candidates as he has recently left his post as Barcelona coach, while Eriksson's position as Manchester City manager is vulnerable. Hiddink, 61, only has a verbal agreement to remain in charge of Russian national team beyond the Euro 2008 finals but his agent Cees Van Nieuwenhuizen says he will stay on.